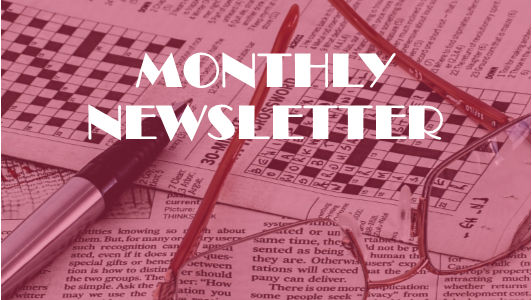 With the start of a new semester; an influx of first years arriving on campus ready to be recruited to your ranks; and freshers’ editions hot off the presses, it’s perhaps the busiest month of the year for student journalists. And September saw a busy few weeks at the SPA too. 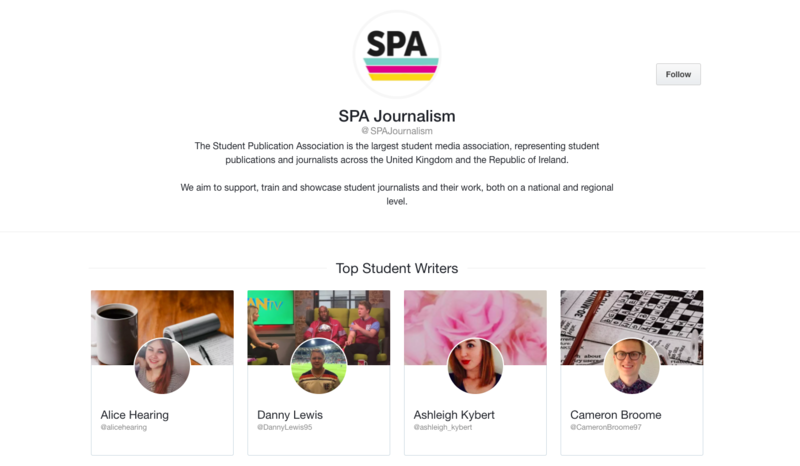 From yet more regional officer recruitment, lining up supporters for our annual conference #SPANC18, and introducing sponsored posts on the website, your committee have been busy making sure the SPA is fully prepared for the year ahead. As always, plenty has been going on at SPA HQ over the last month! I’m pleased to say that we have finally updated our membership page of the website, a project we have been working on for the last few months. You can now take a look at which publications are affiliated with us and even break them down into their regions. If you can’t see your publication listed, feel free to apply for affiliation here. This month I’ve been keeping my eyes peeled for the very best Freshers’ Week content, for our Freshers’ Guide special edition of Splash Sunday. I’ve also been working with Conor and the rest of the committee to boost engagement from our Northern member publications with our recruitment process for a new regional officer. Its a crucial role for the SPA, and if you’re interested, hit any of the committee up with your questions. I’ve also been offering advice to some of our members with issues they’ve been experiencing. Remember we’re always here to help, and no problem is too big or too small! This month the website has undergone a couple of changes. During this past week I have created a sponsored posts section on the website, which will feature content from companies who support the SPA. The first of these, from online portfolio service Wakelet, is available to read here. From today you’ll also see an advert from Wakelet appearing on our homepage. More adverts may follow in the future, as our marketing officer Megan is working hard to find great companies to advertise with and support us. As always, if you have any technical problems, drop me an email at digital@spajournalism.com, and I’ll do my best to help. It’s been another busy month for marketing and I have a big announcement that I’m thrilled to make. I have just secured a third big sponsor for #SPANC18. This means we have already raised the same amount of sponsorship for #SPANC18 as was raised for #SPANC17 – and we’ve still got quite a few months to go! Stay tuned for the official announcement of our latest sponsor really soon! Don’t worry though, I’m not stopping here, because the more sponsors we get, the cheaper the conference can be. We will also be opening up bids for SPANC really soon, so watch this space and hit me up if you have questions. I’m also pleased that this month will see the first online advert on our website. This is something James and I have been working hard to make a reality because this will being year round revenue to the SPA, which can only benefit our members. 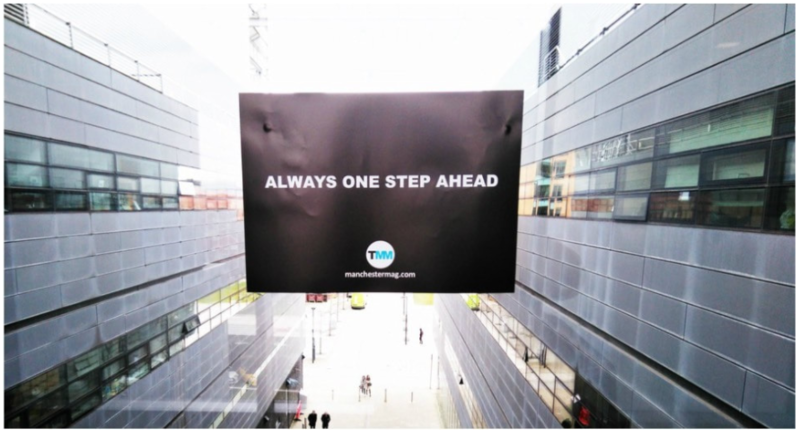 But don’t worry, we don’t let just anyone advertise with us – we are working to make sure our adverts remain relevant and useful for you guys. It’s been an encouraging month for development, in terms of creating our training resources for members. Initial talks with a few companies have begun, but these things take a long time and there is no news to be announced yet. Watch this space! In other updates, our North regional officer resigned earlier in September, and we are still actively looking for a replacement. Its vital that our members have a local point of contact; a first port of call for any issues they may be experiencing; and a friendly face to keep the regional Facebook page updated. If you live in the region and are interested, apply here. Don’t forget to also check out this great guest post on the SPA website by our pals at Wakelet – have a read here. And make sure to make a profile so you can be featured on their page of upcoming student writers. Here’s what they had to say about it: “Having a great portfolio gives you a massive edge when it comes to securing future employment. We’re putting together a list of the top student writers in the UK and Ireland, and helping them share their portfolio with the world. This month the SPA is recommending the Longform podcast, a brilliant series looking in-depth at some of the best longform pieces of journalism and writing being published today. Episodes featuring David Remnick, editor of the New Yorker, and writer Rachel Kaadhi Ghansah have been particular highlights. 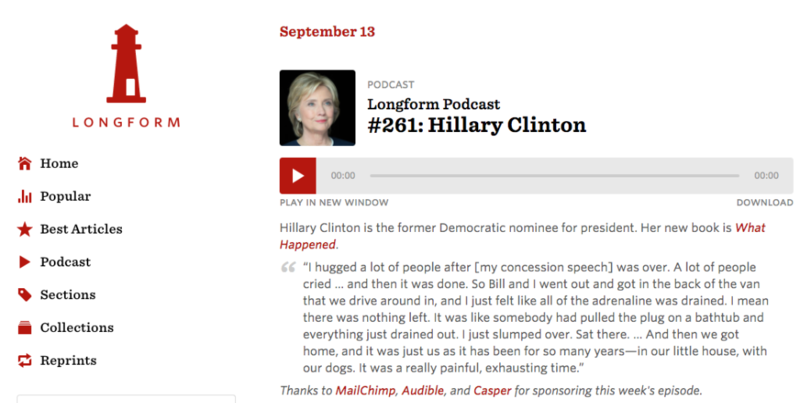 This month we’d like to especially recommend the episode on Hillary Clinton’s recently published book, ‘What Happened’. A fascinating conversation and a real look into the whys, hows, and WTFs of the 2016 US presidential race. Thanks to trustee Jem Collins for spotting the SPA being mentioned in this article from The Manchester Magazine – winners of our best new publication’ award at #SPANC17.